During self care week (12 – 18 November 2018) health commissioners in Sefton are launching a new policy which follows national guidance, explaining that prescribing of over the counter medicines is changing. NHS South Sefton Clinical Commissioning Group (CCG) and NHS Southport and Formby CCG are explaining to residents that GPs, nurses and pharmacists are no longer recommended to routinely prescribe over the counter medicines for a range of minor illnesses in their medicines self care policy. There are exceptions to the guidance which are detailed in the policy and more vulnerable patients will still be able to access the Care at the Chemist service. Many common conditions do not need a prescription and they will often get better on their own, with medicines that can help with the symptoms, bought easily from pharmacists, supermarkets and local retailers. They are known as ‘over the counter’ medicines and you do not need to have seen a doctor or have a prescription to buy them. That means you don’t have to wait for an appointment at your GP practice. Susanne Lynch, head of medicines management at NHS South Sefton CCG and NHS Southport and Formby CCG, said: “We thought self care week was a good time to tell people about our new policy which will help them to care for minor illnesses without going to their Doctor. 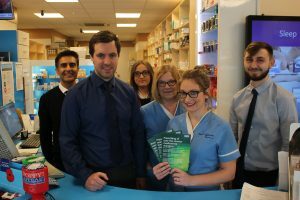 “It is important to say that vulnerable patients can still use the minor ailments scheme, Care at the Chemist which is available in 20 pharmacies across Sefton. I would also like to add that there are exceptions in the new policy for certain circumstances where people will continue to have their treatment prescribed. Ross Powell, a pharmacist in Sefton, said: “There are changes coming in but there will be some exceptions which are detailed in the leaflet. We’re more than happy to offer advice to you and our teams are all qualified to assist. Cllr Catie Page said: “The changes may confuse people at first but I believe that our pharmacists will give people the support that they need. “I think self care is so important and I go to my chemist at the start of each year and think about what I need for my family, that way we are prepared when one of us becomes ill and can treat it and hopefully avoid seeing the Doctor. This policy does not remove the clinical discretion of prescribers in accordance with their professional duties. Ditch Those Stabilisers back by popular demand!